Multifaceted cryptocurrency project UniFox, aiming to deploy ATMs and crypto POS terminals worldwide, has formed a partnership with Achain to collaborate in crypto adoption and include ACT in its products. In celebration of the partnership, UniFox has decided to give away a total of 20,000 FOX tokens to the first 1,000 people to use a unique promotional code. UniFox's motto is expressed as "Imagine MasterCard for cryptocurrencies". This project has already invested over $7,000,000 USD into their technologies and has 4 working products. Unifox has entered the crypto currency market and offer their security token to the public through their ICO that is scheduled for late September. I have not encountered Achain and I do not know how successful this company is and whether it can be trusted. However, this is good news that the team is looking for any partners and is trying to spread the information about its project. Worldwide mastercard or restricted with some countries? You have a point and probably the team already been taking down some of the good suggestion that have been made by some concern netizen. This is what also makes it interesting because the team are open for suggestions which is for the betterment of their platform. It is true that we can say our opinion and suggestions freely to the team. This is one way to have a good relationship between the developer and the participants which is very important to have and very helpful in order to have a better result because many heads are better than one head. Hope for the success of this project, I am confident that it is near. Cryptocurrency doesn't need ATM to be transferred, it can be done online. ATM is for physical money ( fiat ), we use to withdraw ( cash out ) fiat or cash in ( put in fiat). On their exchange you will have ability to convert between multi-cryptocurrency. This is long time working of Unifox. At least, we can see the effort of Unifox team at nearly some days. Great news for Unifox-er at this time. A lot of people will see they have right decision when support Unifox. Yeah, even the community can give reasonable questions and opinions that might give idea or help, which is why communication is very important. This is a good partnership, at first I thought you are going to use Achain instead of Ethereum blockchain but it seems like ACT token will only be available to be bought using the unifox platform. As far for I think this is a good news for the team for partnering and working with some legit companies? Any alternative payment also to buy ACT? Great to hear that the team are really serious doing business for the project, 7 Million USD is not a joke for a company to put their capital at risk right? definitely this is a very cool idea, you can easily replenish your wallet with the necessary crypto currency. What price will the commission for transactions be taken by your ATMs? Indeed, the idea is simple and convenient. To be able to buy a cryptocurrency with fiats is very attractive and likely to do by most people here because it can reduced transactions fees and hassle. Hopefully, the team can launched it as soon as possible so that we can be able to see how it works in real time. I would really like to try using these ATMs in real life. But unfortunately they will be available only in Asian countries. Do developers plan to deploy their ATMs in Europe in the future? This partnership opens the doors for Achain to be included in all of UniFox’s products, including ATMs, POS terminals and local exchanges. 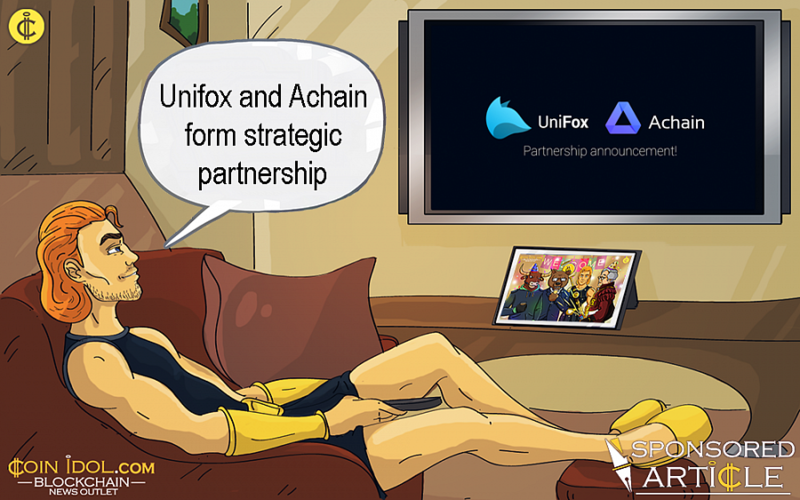 Now I have knew that the UniFox and Achain has a partnership. Well seems like this partnership will click people are keep on giving their different suggestions as well as their feedback. This partnership gain the attention of the crowd. Hopefully that this will keep a strong and smooth flow of relationship for their both benefits as well as to achieve by the UniFox project team their goal towards this community and provide what the people needs and wants. When will the tokens be added to the Online Exchange Platforms? I really really do not use them, who has experience on these exchanges? We also need to insure the opinions and question that is related to the topic. Still the team have the right to either answer your question or be ignored. You should read first before writing down some questions or opinions. Wow! Unifox and Achain are now being partnered. This is a great opportunity for everyone to look with the project which it will expand the range of UniFox and will make a great opening. what are your nearest plans for partnership agreements in the near future? Because you need to conclude as many contracts as possible, for a wider choice of crypto currency at your ATMs and terminals. This way of partnership makes the success done as we can observe easy formation, More capital, Combined talent and Judgement skill, Diffusion of risk, flexibility and highly professional team workflow reaps us to an outstanding delivery with excellence. To my conclusion it is not acceptable if not answered by the project management as they are responsible to answer all the queries and even need to be honored for all the investors who choose the project after understanding the project whitepapers and team workflow as believed.